Penzance Gazette: Read All About It! “PENZANCE, considered either in reference to population, intelligence, wealth of commerce, is not inferior to any other town in Cornwall”. So it begins: the “Prospectus” which forms the first column of the first edition of our very first local newspaper - the Penzance Gazette. Fishing, mining and the landing of cargo come in for special mention. The Bay offers safe anchorage, and its margins warm and fertile soil. And in recent years, a new source of prosperity: “a very many opulent strangers come hither from all parts of the kingdom to enjoy the unsurpassed beauty of the scenery and the renovating… air”. And it isn’t just about money. “In the cultivation of Science and Literature” Penzance, which has already produced “a BORLASE… a DAVY and a GILBERT” may “stand prominent among the towns of Britain”. Yet until today, West Cornwall has lacked one vital component of cultural life: a newspaper of its own, the absence of which “hitherto” is surely more surprising than its appearance today. The editor, Edward Boase, admits to his own political views, but is determined to avoid the trap of partisanship. He will not, he states, allow his newspaper to have “its sphere of influence circumscribed” by becoming “the organ of a faction”. It will be “sizeable enough to be useful” - he promises to fill twenty columns a week with “closely printed matter”. The publication day will allow Mr Boase to report on the Monday market prices in London, in time for the Penzance and Truro markets. Intelligence brought in by the Falmouth Packet ships will be sent over to Penzance by “special express”, while outgoing news for “our COLONIAL and FOREIGN readers” will be bang up to date. And the price, 21/2d (1p, or the equivalent of around 40p in 2017), is “within the reach of almost every family”. So, what is the reader to make of this first edition? On the front page, of course, there are advertisements. Should you require store ewes from prize-winning stock, Mr Faull is leaving his farm at Michaelmas and thus has a genuine reason for sale. If “Fat and Feeding Cows”, “Milch Cows in Calf”, horses or pigs are more in your line, or if you have an interest in potatoes, “Rutabaga turnips” by the acre or “a quantity of Reed”consider attending the forthcoming sale at Trewidden. Higher ambitions? The “Capital Estate” of Trevabyn, in St Hilary Parish, is available. On the other side of town “Regennis” is to be let, and offers are invited for a 14-year lease. 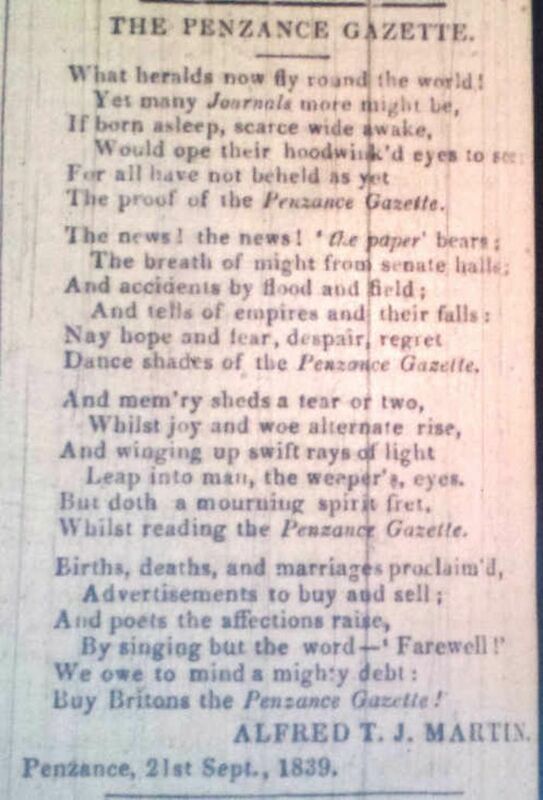 You might also be interested to know that enterprising businesswoman Ann Drawn, who will later own the Gazette, has recently taken charge of the Western Hotel, from which premises she will later print and distribute this very publication. But that is still in the future. For now, she offers: “WELL-AIRED BEDS, a GOOD LARDER, CHOICE WINES, NEAT POST CHAISES and ABLE HORSES”. What more could a traveller require? No wonder Ms Drawn is confident of securing “a liberal portion of public patronage”. And there seems to be a book-selling war: Mr Rodda, “SUCCESSOR to MR VIGOE” has managed to secure a few copies of Dr Paris’ Guide, “out of print” for the past two years. Meanwhile Mr E Paddy, printer and bookbinder, boats “a great variety of the cheapest books ever yet offered to the Public”. If it’s news you’re after you need, of course, to part with your 21/2d and look inside. There is plenty of intelligence from up country, and from sources nearer to hand: melancholy, curious or improving. Here are all the latest prices for tin and copper - and for foodstuffs, as sold locally and in London. At home, several miners have drowned crossing from Penzance Pier to Prussia Cove; their 14ft boat lacking sufficient ballast, it seems, to withstand a fresh north-westerly breeze. And if you suspect your tea might not be all it seems, there is advice. Examine the leaves after the first pouring; should they be a “sloe or ash” colour, you may be sure that you have been gulled – that the original black was no more than dye. “Intelligence, wealth of commerce…. the cultivation of Science and Literature”? More than that. All human life, surely, is here. Value of 21/2d in 1839, https://www.nationalarchives.gov.uk/currency/results.asp#mid accessed 19 8 2017. The “spending power” equivalent given is 37p for 2005.